Whether communication goes through voice and video calls, emails or social network, combining voice and video calls in a user-friendly interface helps you in the transformation from a traditional phone environment into the world of Voice-Over IP. You can initiate conference calls, audio and high definition video calls include screen sharing with up to four parties at a time. Whether you’re having a conversation with customers or a simple voice conversation with a business associate or an in-depth discussion with a colleague over video, you’ll soon see why having a softphone on your desktop or laptop is the ultimate communications experience. This application will launch new Internet Explorer when incoming call received, it will search for the Caller-ID on TrueCaller and you can simply replace it with your CRM, HelpDesk or other web system to inquiry about the Caller Based on his Caller-ID or Caller-Name. You can connect it with any customer database like CRM, POS, or Helpdesk like Microsoft CRM, Remedy, Citrix, Sales Force and many more. 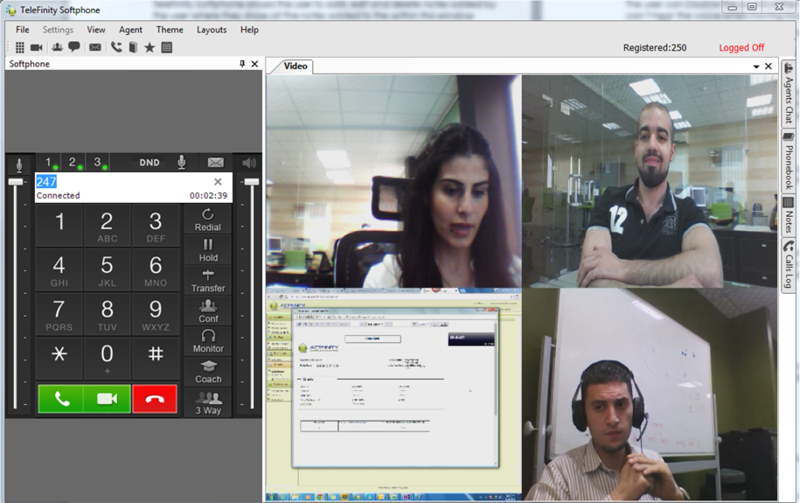 Four way HD video conference calls can be established with audio/HD video and screen sharing capabilities using (1024p) H.264 codec. Busy-Lamp-Field is an easy way to monitor other extensions status whether they are busy, ringing or idle. Any information related to the customer that you have can be shown to your agents in a pop up window giving them information. The Softphone user will be able to manage multi-purpose keys on the Softphone to save terminals (extensions) that can be used later as speed dial keys or busy line fields, also to save phone numbers that can be used as speed dial keys. 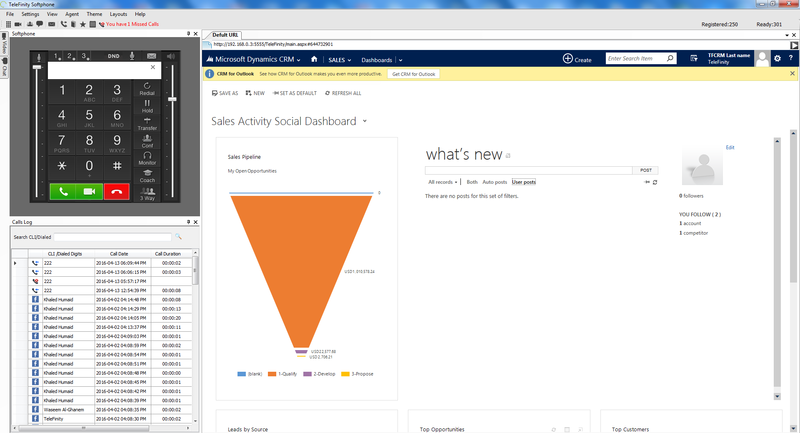 Agents will have the ability to open a new browser tab, which enables integration with other web-based solutions such as CRM, POS, Help Desk or any URL with multi-tab capabilities. The Softphone user will be able to access the extension mailbox after voicemail configuration. In the Softphone there is a phone-book you can save on it names and numbers, as well you can export and import contact details in to a CSV file easily. The Softphone has a phone book that can be used to save names and numbers, as well as to easily export and import contact details onto a CSV file. One of the main features of the Softphone is supporting multi-media features: email, chat and video. 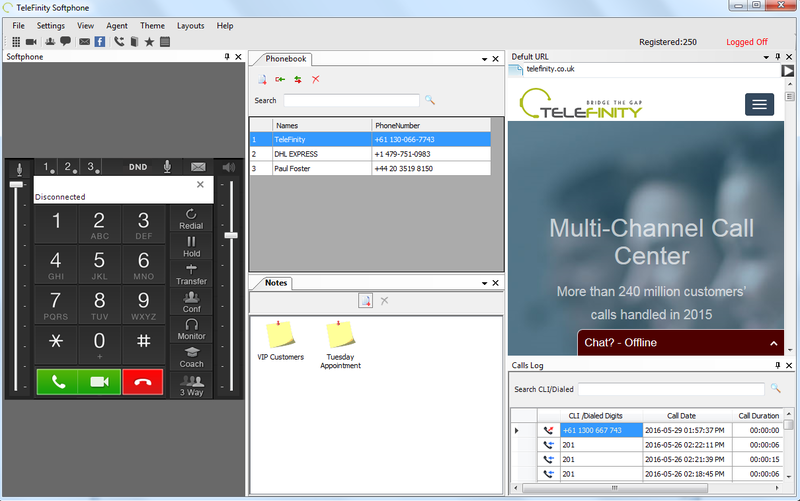 If the chat service is activated on the TeleFinity Contact Center, the agent can receive live incoming chat from the company website as a normal call. The same thing happens when using email or social media. After agents complete a call, a wrap-up time allows them to take a break between calls. No calls will be routed to them. Agents have the ability to cancel the wrap-up time and start answering calls. Managers can coach agents without the customers’ knowledge. Employees can use the Softphone to chat with each other and with their managers. After the call has ended agents can categorize the call in to a specific category when the Call Categories pop-up . To assign a call category, agents must select one from Call Category drop-down list.